@ Thai Volunteer Service Bldg. สมัครผ่านโปรแกรมธนาคารจิตอาสา หรือกรณีไม่สามารถสมัครได้ ให้สมัครทาง E-mail ได้ที่ volunteerservice@gmail.com โดยสมัครทางใดทางหนึ่งเท่านั้น โดยแจ้ง ระบุกิจกรรม “หมอนหนุนอุ่นรรัก 28 เมษา’61” ชื่อ/สกุล ……. อาชีพ…… E-mail …… เบอร์โทรศัพท์……. Country of Thailand has a small community child Center for preschool children, scattered across the country in almost every subdistrict, or in municipalities, including large urban centres. Many centers are under operation of local governments, many are under the care of the community, and many are under the supervision of NGOs. According to the Center for young children, preschoolers will need to have time to sleep during the day. Baby bedding set is therefore essential, but many still lack bedding set; pillow, mattress sheet and blanket. There just isn’t enough, or ever, it was too damaged to use. Volunteer activities to produce bedding set for preschoolers so held 2 events is a volunteer, to produce pillow and volunteer to produce mattress / padded to fill the love, warmth, for disadvantage children under the project of Citizen Volunteer. Energetic citizens together to build good society, we believe that when the small combination to become big power and beautiful society as well as to create a culture of social courtesy and sharing society. 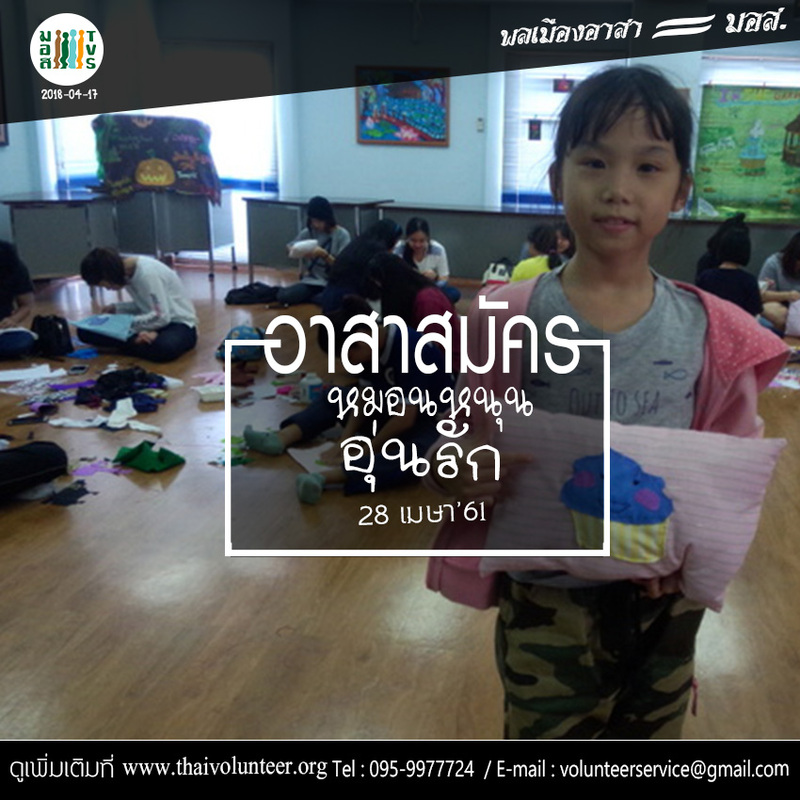 12:30 Exchange experience of volunteer work and present your decorated pillow. line 136 / 137/ 172/ 185/ 179/ 206/ 514/ 73ก /517 get off Soi Ratchadaphisek 14 opposite the Kunnatee School, walk into Ratchada 14, you will see 7-11 Mart, turn right and walk straight then turn left in front of You Mansion, walking onward for approximately 100 meters.